This unflattering glamour shot kept many a discriminating youth away. The epic struggle between Trashcan and Fan. 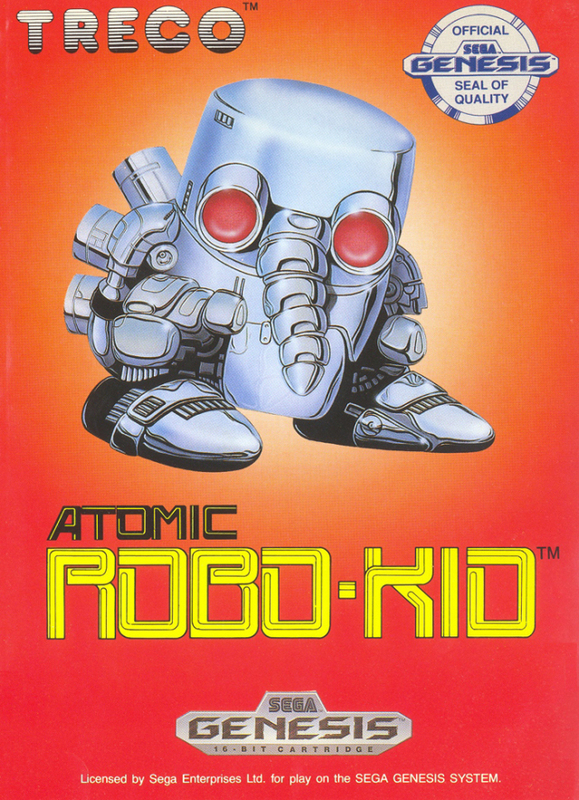 And lo, Atomic Robo-Kid, with his goofy clown feet, phallic elephant nose, red piercing eyes, and trashcan body, was born, gifted with his very own horizontal shoot-em-up. Does his unique shape and abilities elevate the genre to new peaks of excellence, or is his clanking stocky frame out of place among the standard ships, heady nights, and neon dreams of the go-go shoot-em-up scene? Built to be a coward. With the exception of his stumbling gait, the Robo-Kid’s abilities are those of a standard ship. He can fly around the level in any direction, hold up to four weapons (Flame Laser, 3-Way Spread, Missile, and 5-Way Shower), and only take one hit before he’s destroyed. One would think that his larger body would help him withstand multiple attacks, but no! He’s a child, he’s vulnerable, etc. The game’s difficulty stems not from the enemies, but from the size of both the protagonist and the stages. 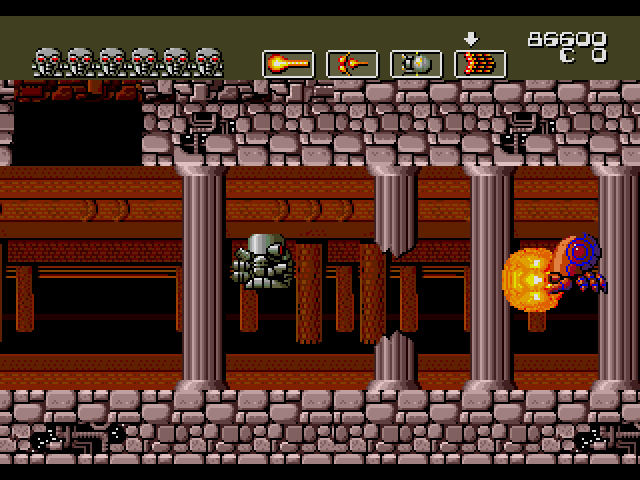 Most, if not all, of the nineteen stages are comprised of narrow spaces, filled with confined corridors that often have numerous enemies shooting projectiles within them. If you were a ship, skinny and sleek, this would not be a great challenge. Because you are a bulky sprite who struggles to fit within these spaces, you must take care. Not all stages are so difficult. In fact, many of them can be completed in thirty seconds or less if you jam the fire button down and proceed with caution. Most enemies attack in clusters and are taken out with one hit, so you’re never overwhelmed unless you’re in a really cramped area. That said, stages either feel too short and easy or ridiculously hard. There’s no consistent middle ground. When the stages are tough, you’re focused on surviving. When they’re easy, you have time to ponder and recognize how slight the stage design is. 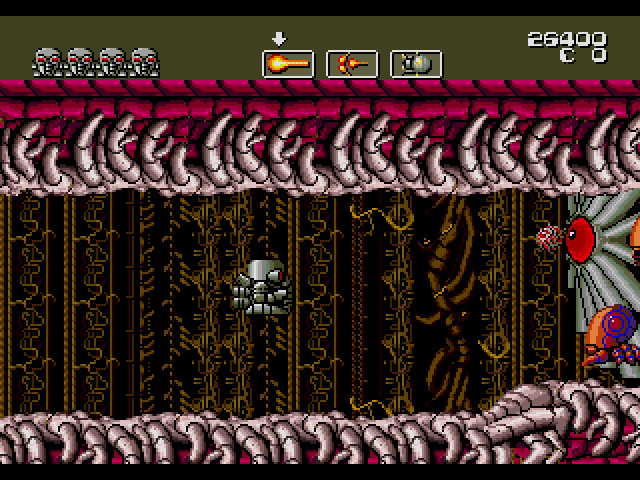 Each area is comprised of generic backgrounds – some alien imagery here, some glowing robot bits there – mixed with the same handful of enemy types in narrow enclosures, some more confined than others. There are no extravagant set-pieces, no “holy crap!” moments. There is… the Robo-Kid, for better and for worse. Programmed with only the finest 90s slang. 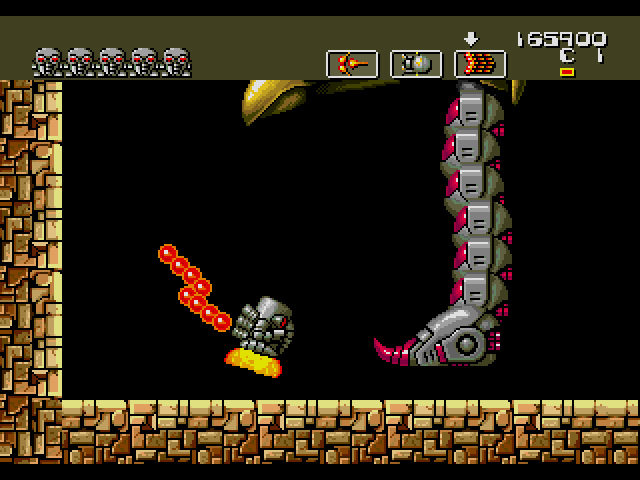 In addition to the stages, the Kid must also take on “governor” boss battles. 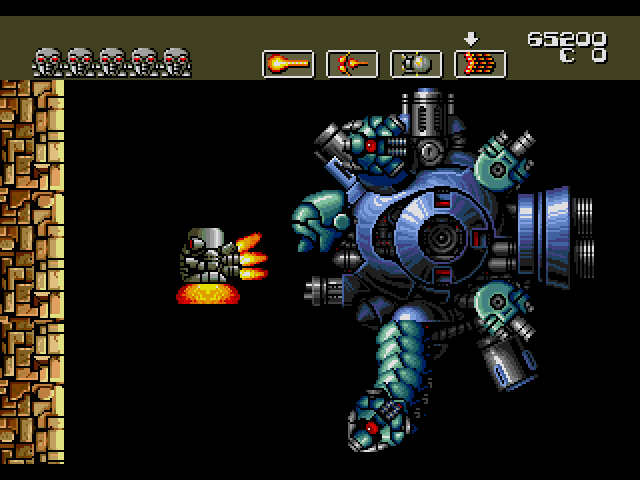 Governors are oversized flying mutants, all of which have a weak point or two. I beat the first two governors with relative ease, but lost repeatedly to the third. He used both quick homing attacks and a scorpion tail that took up half the screen to decimate me. Since my large, slow robot couldn’t avoid these attacks and shoot the governor at the same time, my time with Robo-Kid ended here. I’m just not cut out for that Robo-Kid life. The duels with the evil Robo-Kids are my favorite part of the game, despite their difficulty. 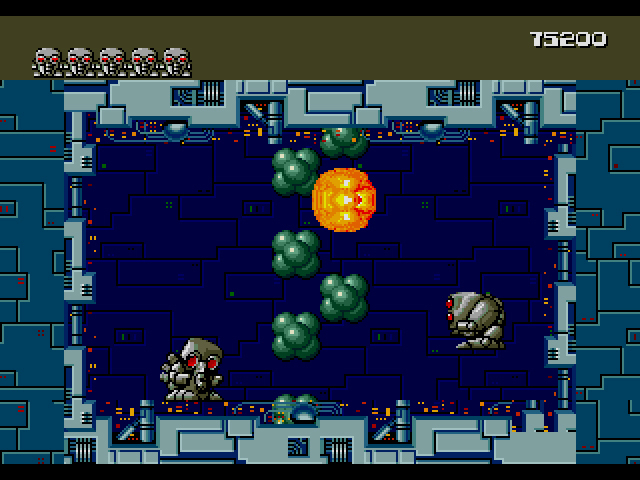 Each Robo-Kid stands on opposite ends of the screen, while two columns of green, destructible orbs move between you both. The orbs don’t hurt you if you touch them, but they do get in your way and they eventually regenerate once shot. 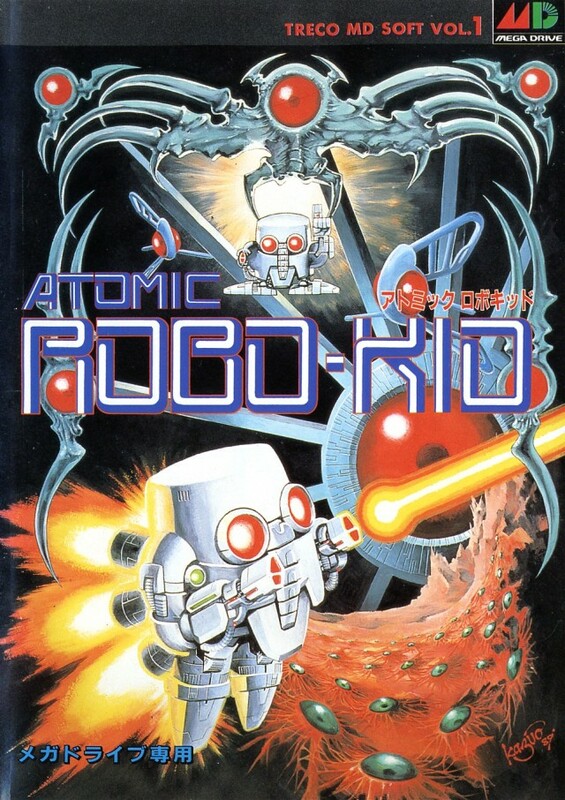 Your goal is to shoot through them and hit the other Robo-Kid once. 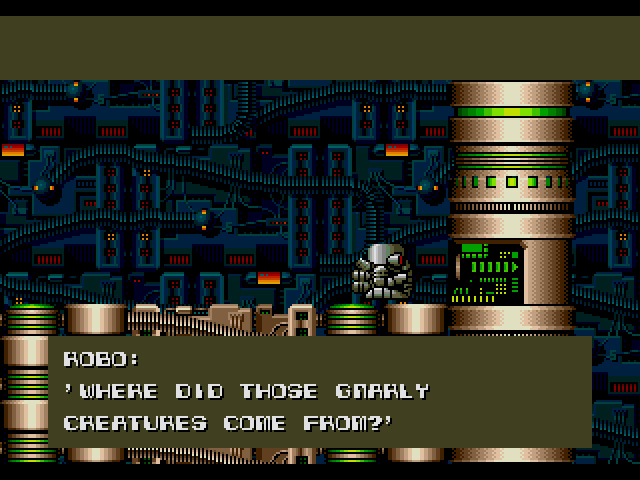 Sounds easy enough, but along with regenerating orbs, the evil Robo-Kids read your moves well. Only a sharp aim will take them down, particularly as the orbs keep coming to shield you both from potential harm. Not all Robo-Kids are created equal, apparently. At first, Atomic Robo-Kid seems like a welcome deviation from the basic horizontal shmups that have littered the Genesis over the past year. Don’t be fooled. The Kid is a poorly designed protagonist for such a claustrophobic shoot-em-up. Rather than construct stages around his considerable frame – stages that would make him a character you want to control – the developers were content to shove the oversized Kid into small areas in order to raise the game’s challenge. Save for the awesome Robo-Kid V. Robo-Kid battles, there’s nothing here that warrants his creation; replace the Kid with a ship and the limited stage design becomes all too apparent. Like so many character-driven games that would come after him, Atomic Robo-Kid hides behind its boardroom-created character for meaning and worth. No would-be mascot should have to bear such a burden. *This is completely fictional, for those who were in doubt. Think I’ve only briefly played this one and I remember it being a bit dull. Not as dull as that Genesis box artwork though…I always prefer the Japanese box artwork, but with this game, it’s not even a contest. On the whole, Genesis box art is considerably better than Master System box art, but they really fudged this one. I always thought this was an interesting concept. It’s a platformer, no it’s a shooter! I definetly was excited to buy this because of the visuals at the time. But the games execution was very wierd. I didn’t hate it. But I’m not gonna lie I didn’t love it eigther. It’s a strange little game with some interesting ideas that don’t really feel like they gel together. I certainly enjoyed it and beat it. But I think in those days that wasn’t saying much. I also could say the same about a lot of bad games as well. I’d say this game could have been B tier but it just missed the mark, but it’s certainly not rubbish. Whether you want to look at it as a shooter or a platformer, the levels are just so uninteresting. There’s very little happening. I do agree, there are some interesting ideas here, but as you said, they’re just not executed well. I dunno. Phallic nose aside, I don’t think that cover is so bad. Off-putting for early 90s youth, sure, but not as fearsomely ugly as early US Megaman covers. At best, it’s just kinda there. Compared to the Mega Drive cover, it’s really sad. This pretty well encapsulates my thoughts, and the game’s biggest flaw. Second to that would be what Sean mentioned, the fact that it sort of marries the action platformer and shmup genres together, but without doing either particularly well. That pendulum swing of difficulty on top of the relatively wishy-washy implementation of the concept, the ho-hum graphics, forgettable music, and slightly clunky control of the ‘Kid, and you’re left with something that feels like it’s not fully baked. I was hoping for so much more, especially having seen ads for this in mags back at the time of its release, and always kind of wondering what the game was like, but never getting to experience it until recently. All I can say is, I didn’t miss much. Yeah, I’m not sure how ARK was received in 1990, but it has not held up well. 1. Respawning enemies unnecessarily annoying. Fix: enemies shouldn’t respawn. 2. Robo Kid is too large for the environment. Fix: Robo Kid should be able to take 3 hits before being destroyed. 3. Levels are inconsistent in difficulty. Fix: add some enemies for the easier levels, subract some enemies from the harder levels, and add in fixes from #1 and #2, and now we’ve got more of a consistent game. Overall I enjoyed this game and your review. But it’s frustrating when there’s some good potential here that gets lost in some flaws that would have been easily fixable. Another one of those “too close to the arcade and not properly adapted to a home console” situations if you know what I mean. This is some great analysis for RoboKid. I agree with your points, although I do believe developer Treco wanted this to be more of a shooter. 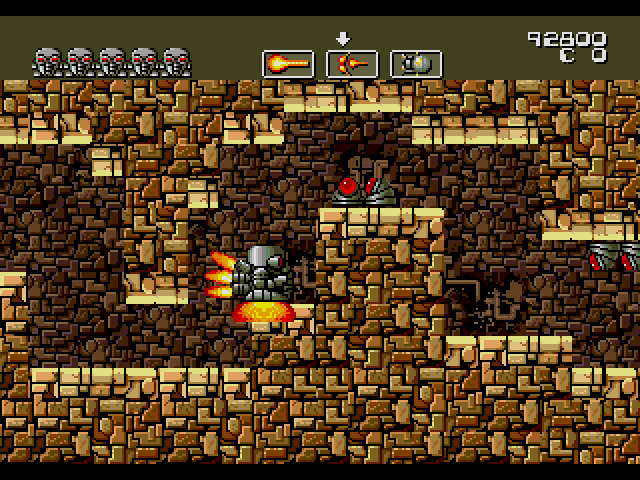 To me, it comes across as a shooter with platforming elements, though neither are done very well. Thanks for the comment, Mike! ARK was amazing in the arcade. This conversion was just poor and did not match the full screen graphics. The sound of the arcade was loud and in your face. Just version was just very bland and a disappointment overall. I’d still love to get my hands on a original pcb.